Explore the range of custom finishes and materials which our products are available in. Design the garden furniture of your dreams! This page aims to clarify the characteristics of each material so you can make an informed choice when choosing the finish of your garden decor. We offer 30 different RAL colours, including aluminium and Corten effect paints. As well as this, most of our products can be made in the metal of your choosing. From budget-friendly mild steel to luxurious stainless steel. We stock a huge variety of RAL colours. These are used to powder coat our products and are available is solid colours, as well as metallic and pearl finishes. A paint finish can be kept outdoors or indoors and is long wearing. Powder coating the mild steel protects the metal underneath to help stop corrosion. This corrosion resistant metal gives a long-lasting, shiny finish. Popular in the Art Deco period, as seen on the iconic Chrysler Building, this material is perfect for outdoor use when you want to keep that fresh, metallic finish. Galvanised steel is perfect if you are after an industrial look. This finish is achieved by dipping untreated steel into a protective zinc coating, to prevent rusting. 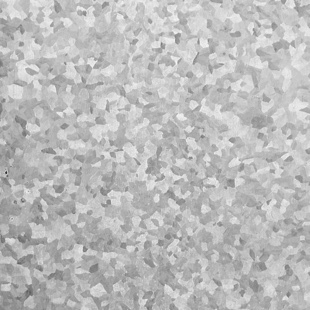 This means that the material is durable and requires very little maintenance. 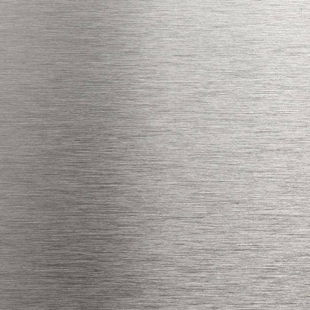 Due to its zinc coating, we do not recommend this finish is used on products that will be in direct contact with food (it is perfectly safe on our tables with glass tops) or products that will be used to contain fire. 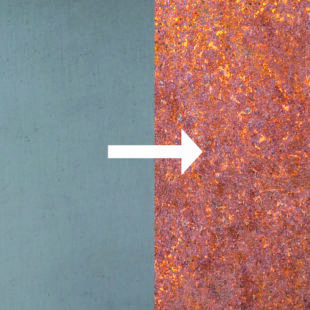 This metal generates its own rust-like coating which protects the metal from corrosion. Every piece is unique, and this incredibly popular finish can be seen on a number of sculptures, including the Angel of the North. 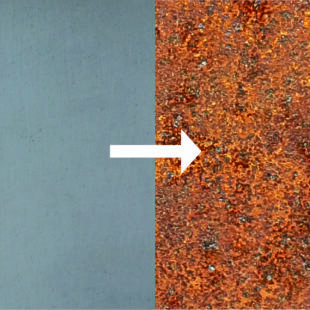 Mild steel, when left untreated, will rust to produce a very similar effect to Corten. However, this material is not as long-lasting as Corten and will eventually rust through. This is a lower-cost alternative to Corten. This is best suited for outdoor use. The rate of deterioration is dependent on the conditions it is kept in, more rain will mean a shorter life span. Mild steel is a lower cost alternative to Corten but can give a similar effect. If you’re after a rusted look without the mess of real rust, then our Corten Effect paint finish is for you! This effect is more uniform than real Corten, however it will not run and brush off onto clothing, so is perfect for indoor use or on furniture, such as a dining table or seating. To choose this finish, select ‘Mild Steel – Powder Coated’ and then select ‘Corten Effect’ under the colour options. This clear coat will preserve industrial details from production. This finish is ideal if you want to preserve the industrial look and stop the item from rusting at the same time. Suitable for indoor and outdoor use.